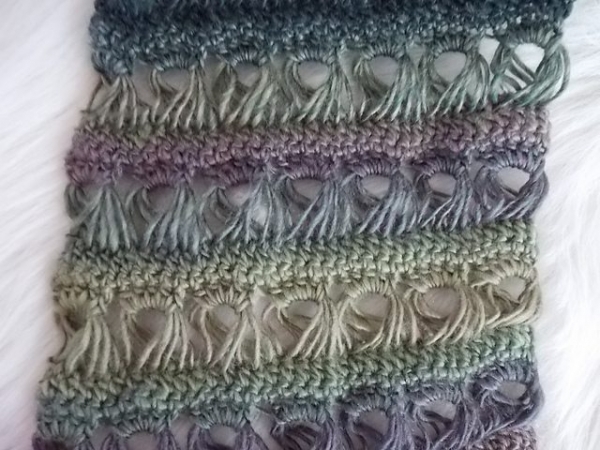 Broomstick lace is one of my very favorite types of crochet. I love the way that it looks and when I finally tried it I loved that it was so much easier than I thought it was going to be. If you don’t know how to do it, you can check out the Ultimate Beginner’s Guide to Broomstick Lace Crochet, which I wrote for Red Heart Yarn’s blog. 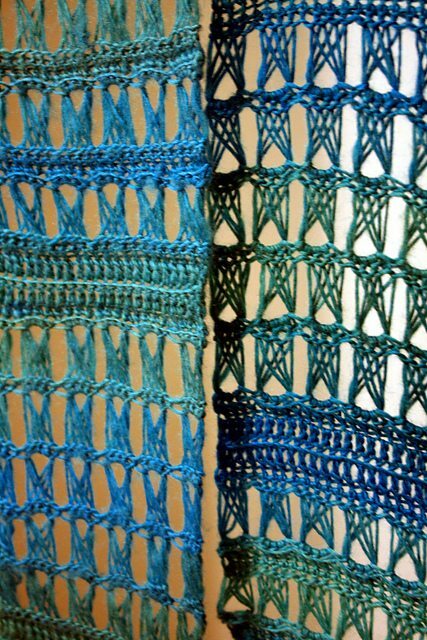 Here we’ll take a look at some wonderful broomstick lace crochet patterns. 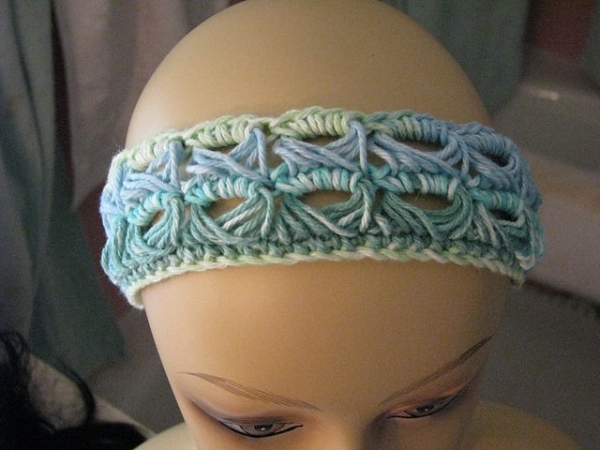 Broomstick lace crochet headband pattern free on Ravelry from E.M. 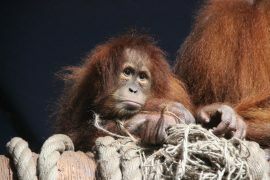 Puff. This is a great instant gratification project when you’ve just learned broomstick lace and it’s also a great gift item to make for girls of all ages. Peacock Stitch shawlette free broomstick lace crochet pattern from Underground Crafter. This is a great broomstick lace crochet pattern for anyone who is just learning the stitch and wants to practice while learning the increase and decrease. 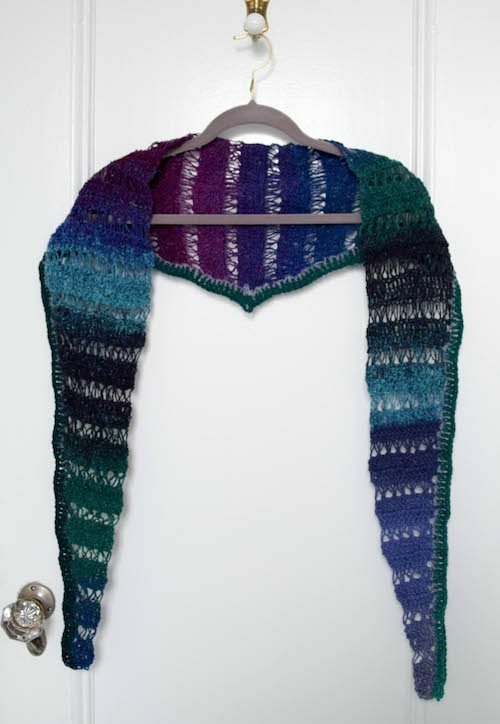 The Emerald Isle patterns is a free crochet broomstick lace scarf pattern on Ravelry from megNEATO. 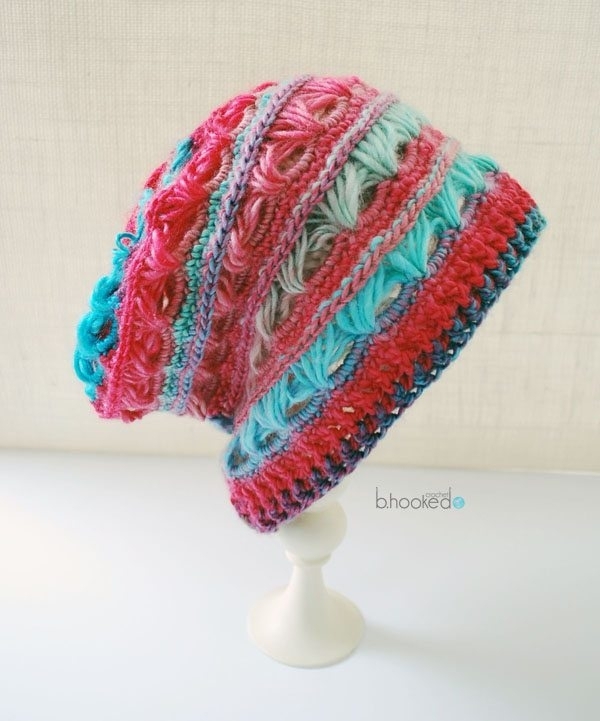 It’s a terrific beginner’s crochet pattern for people who are just getting used to the stitch and want to work it without a lot of other complications. The rows of broomstick lace are stabilized by rows of basic stitches. 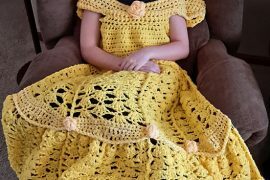 This is a free crochet dress pattern incorporating both Tunisian crochet and broomstick lace – a unique combo, which is why I featured it recently in my roundup of 100 unique crochet dresses. It’s the Ocean Vista Dress on Free-Crochet.com. This broomstick lace crochet cardigan pattern is taught in the Stitch Diva Craftsy class on Broomstick Lace. 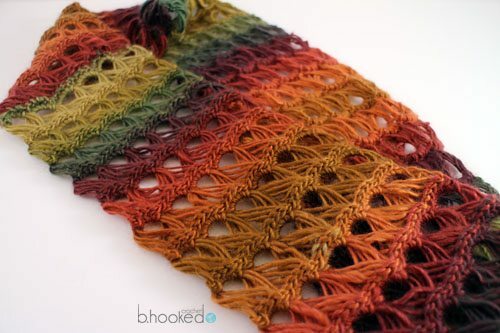 That’s another great way to learn about broomstick lace and how it can go beyond just a basic scarf and really become a flattering feature item. 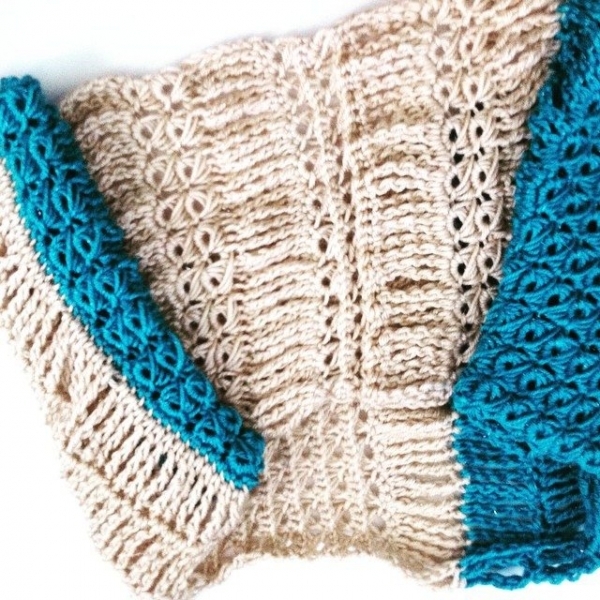 Broomstick lace infinity scarf free crochet pattern from Speckless who also has a free crochet pattern for a broomstick lace collar. The Pommi and Pearls Shawls is a crochet crescent shawl pattern for sale from Voie de Vie, featuring broomstick lace crochet accents. I love this combination of broomstick lace with other crochet lace worked in such a rich color. My broomstick lace crochet cowl free pattern over on the Red Heart Yarn blog. 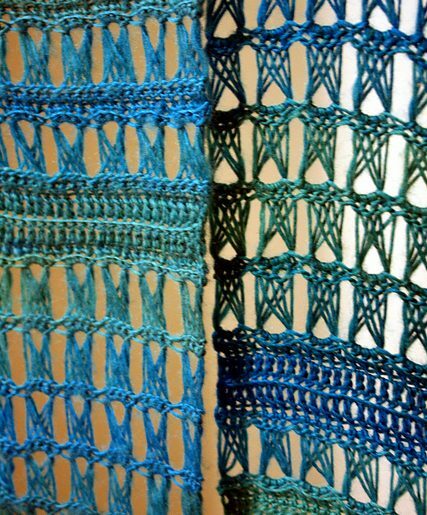 This pattern combines the use of tall stitches with broomstick lace and uses sand-and-sea inspired color blocking. Broomstick lace crochet top free pattern from Mama in a Stitch. There aren’t too many crochet clothing options using this stitch (accessories are far more common) so this is an especially wonderful pattern to bookmark if you like broomstick lace. 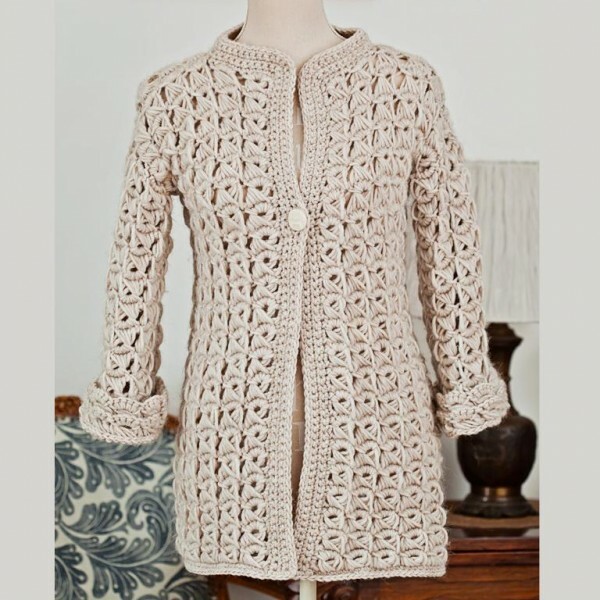 The broomstick lace crochet cardigan pattern for sale from Mon Petit Violon is another great clothing option! 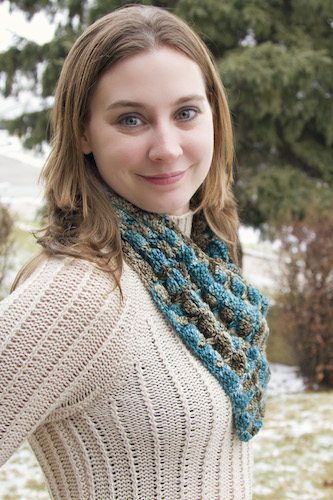 Broomstick lace crochet scarf pattern for sale from April Hubbard. 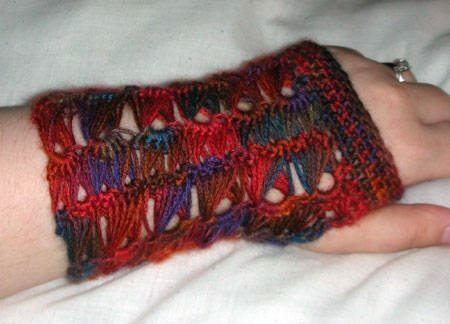 This one is another one that is worked in Unforgettable Yarn. It’s clearly a great yarn choice for this particular niche of crochet. 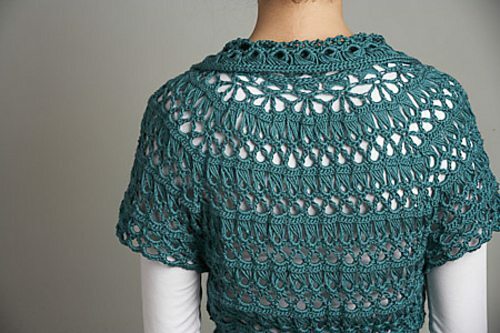 Doris Chan’s Chamomile Cardi is another great example of wearable crochet using broomstick lace. 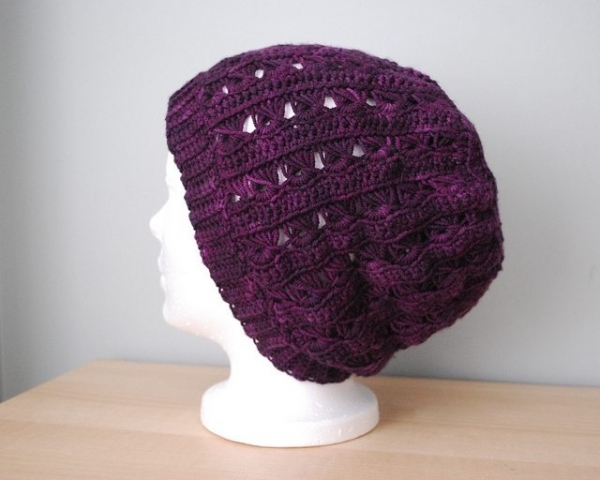 It was originally published in the Spring 2011 issue of Interweave Crochet and is now available for sale online. Doris Chan does really great work using this technique; search her designs on Ravelry and you’ll find broomstick lace crochet patterns for a belt, a capelet, a jacket and more. 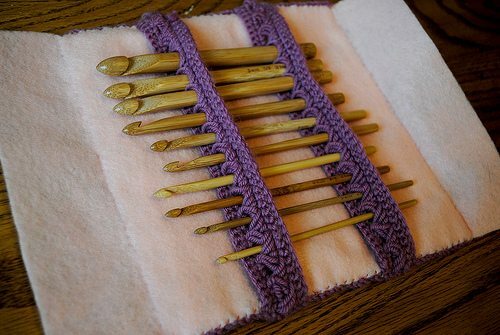 Broomstick Lace crochet hook holder clutch free pattern from CrochetKitten. This is something that you can make using just a little bit of broomstick lace. 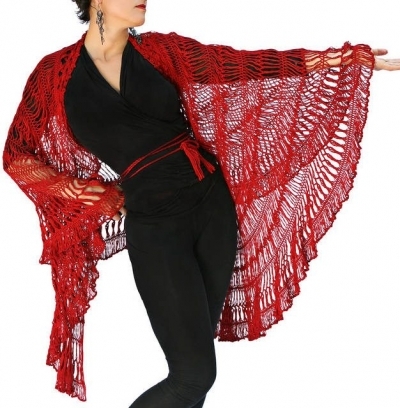 The Andalusia is a convertible crochet shawl worked in a combination of broomstick and hairpin lace. It’s made by a master in these techniques: Jennifer Hansen. 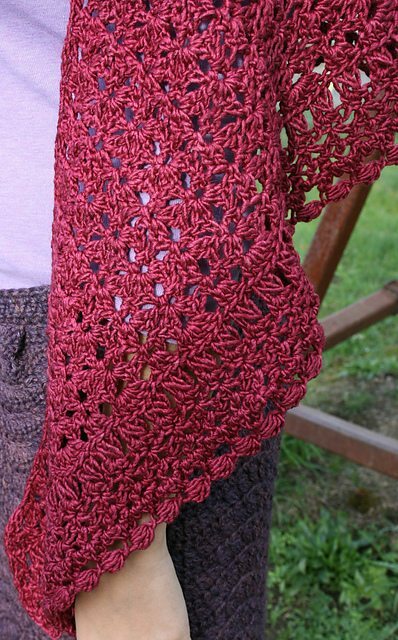 This crochet shawl pattern is for sale online. 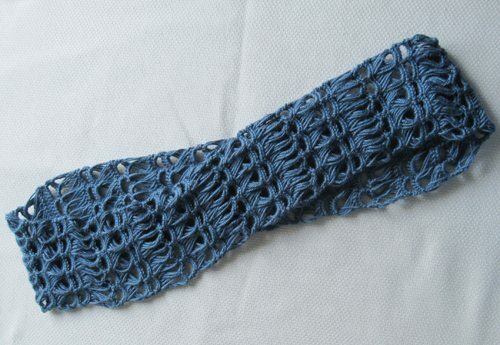 Broomstick lace wristers free crochet pattern from Gritty Knits. 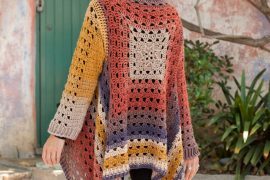 What’s really interesting about this crochet pattern is that it uses two different sizes of the needle that you draw your crochet loops onto so you get a fascinating effect. 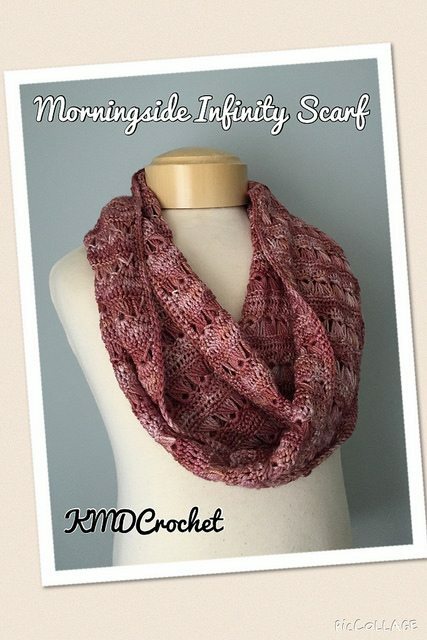 Lovely collection, Kathryn, you have a wonderful eye for crochet!